Festival directors and captains of the film industry debated and discussed the way ahead for Chinese cinema in the global arena at a China Daily Asia Leadership Roundtable forum. 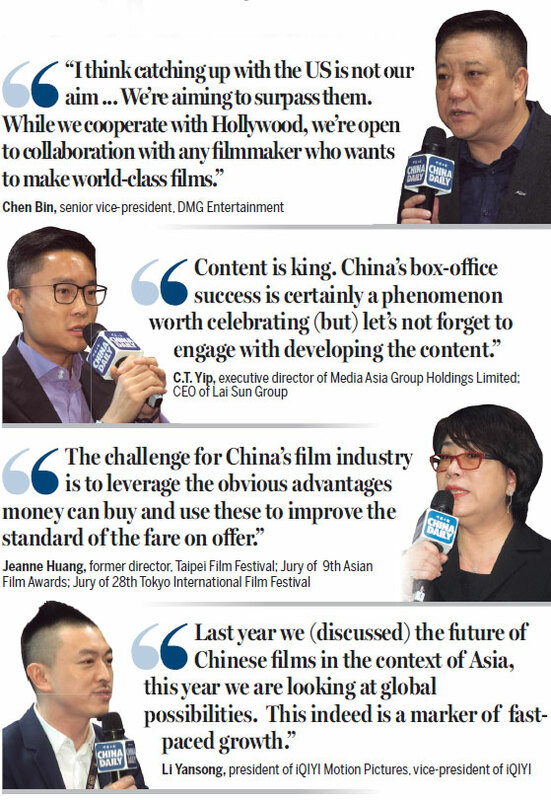 Li Yansong, president of iQIYI Motion Pictures and the final speaker at a China Daily Asia Leadership Roundtable held on March 16 as part of the Hong Kong International Film and TV Market (FILMART), succinctly summed up the progress made by Chinese films during the past year. Referring to the roundtable forum hosted by China Daily at the previous FILMART, Li said: "Last year we were discussing the future of Chinese films in the context of Asia, this year we are looking at global possibilities. This indeed is a marker of fast-paced growth." 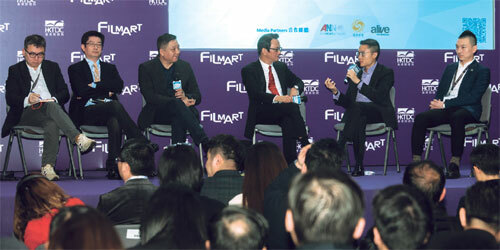 This year marked the 20th edition of FILMART, a four-day event at the Hong Kong Exhibition and Convention Centre which closed on Thursday. The China Daily Asia leadership Roundtable this year welcomed 12 eminent personalities, including film festival directors and educators, high-profile facilitators of industry-government cooperation in filmmaking, production company heads, big-time distributors and new-age film development professionals. Zhou Li, editorial board member of China Daily Group and publisher and editor-in-chief of China Daily Asia Pacific, delivered the keynote address. "Revenue from China's movie ticket sales is now second only to box offices in the US. In 2015, box office earnings in China touched a record $6.8 billion, up by 49 percent from the previous year, according to the State Administration of Press, Publication, Radio, Film and Television," Zhou said. He pointed out: "While North America too made more revenue than before, an estimated $11 billion, that market grew at a much slower rate of 7 percent, compared to that in China." Michael C. Ellis, president and managing director Asia-Pacific Region for the Motion Picture Association, went a step further to predict that Chinese box-office takings will overtake the US by 2017. "In February they already did, for a month," he noted. "This is a market that is accelerating and the growth has been really staggering. Keep adding 30 percent every year. It's going to be absolutely huge." One way to beat the home of Hollywood at their own game would be to get more Chinese to go watch movies on the big screen, he added. "In America 9 in 100 people go to the cinemas once a month. In China the figure in 3.9," Ellis pointed out. "If we could get more Chinese to go to the theater we might be able to close the gap." While China's box office takings continue to multiply, the challenge before the country's film industry is to leverage the obvious advantages that money can buy and use these to improve the general standard of the fare on offer. China's filmmakers can take a leaf out of the book of Taiwan filmmakers, who would not compromise on quality for the sake of a few extra bucks that co-production might bring, according to Jeanne Huang, former director of the Taipei Film Festival. While the Chinese mainland film industry has its obvious influence on film makers in Taiwan, the new-wave directors "are more alert about retaining their own cultural elements and keeping away the 'commercial' stuff, even if it means losing money," Huang said. Her sentiments resonated with those of C.T. Yip, executive director of Media Asia Group Holdings. "Content is king," he said. "Historically money has not always helped create great content or the ability to appreciate it." So while the mainland box-office success is certainly worth celebrating, "let's not forget to engage with developing the content". Responding to a question from moderator Alexander Wan, senior advisor to China Daily Asia Pacific, Yip noted Hollywood's interest in Asian content - the evidence of which is in the Wachowski brothers making a wuxia-inspired Matrix, among several others - underscores the fact that "a good story goes beyond the color of the maker's skin" and is appreciated for its ability to cut across cultural barriers. A few panelists drew attention to the fact that China's recent box-office success is best viewed against a bigger picture. Kriengsak Victor Silakong, director of the World Film Festival of Bangkok, noted the popularity of Chinese films is slipping in Thailand. While they were hugely popular in the 1980s, when Hong Kong actors enjoyed a massive following, last year just three Chinese films - two low-budget independent films and a documentary - got a theater release in Thailand. "To get Chinese films back to the ASEAN countries (Association of Southeast Asian Nations) and the Indian subcontinent is the big task (for the Chinese film industry)." The box-office race with the US looks different when one considers its population of 320 million against China's 1.3 billion, said Chen Bin, senior vice-president at DMG Entertainment. "I think catching up with the US is not our aim," said Chen, whose company facilitates shooting of Hollywood films in China, sometimes in extreme locations, such as the blockbuster Transformers. "We're aiming to surpass them. While we cooperate with Hollywood, we're open to collaboration with any filmmaker who wants to make world-class films." He ended his impassioned speech with an invitation to open a dialogue on the possibilities of cooperation. "As long as we have a shared value of humanity and want to entertain people, we could work with people, irrespective of their color, culture and ethnicity." C.T. Yip, second right, answers a query from moderator Alexander Wan as the other panelists look on. Zhou Li, editorial board member of China Daily Group and publisher and editor-in-chief of China Daily Asia Pacific, delivers the keynote address. Jeanne Huang, second left, and Kriengsak Victor Silakong, far right, both film festival veterans in their respective nations, engage in an animated discussion as Amy Liu, far left, and Alexander Wan listen.